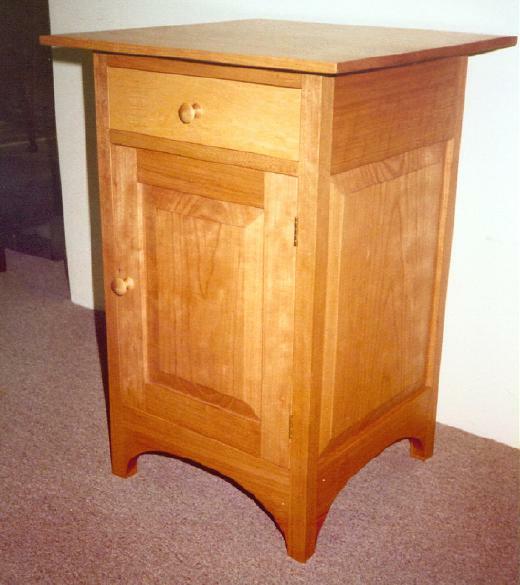 Shaker Style Cherry Wood Side Table with a Birdseye Maple draw in a natural cherry with a penetrating oil finish. It has a slender square tapered leg that is only 5/8" at the floor. 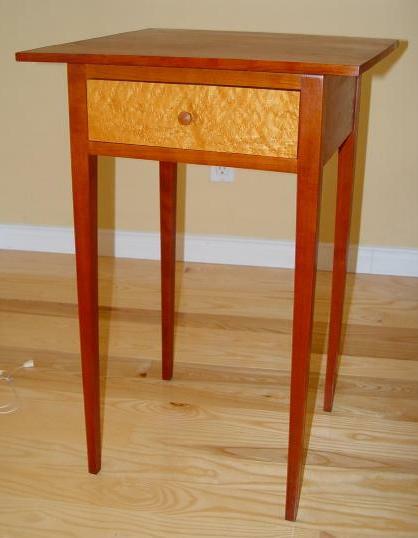 This table is in our personal collection and has developed a natural deep red/brown cherry color. The top is 18" by 18" and the table is 27 1/2" high. 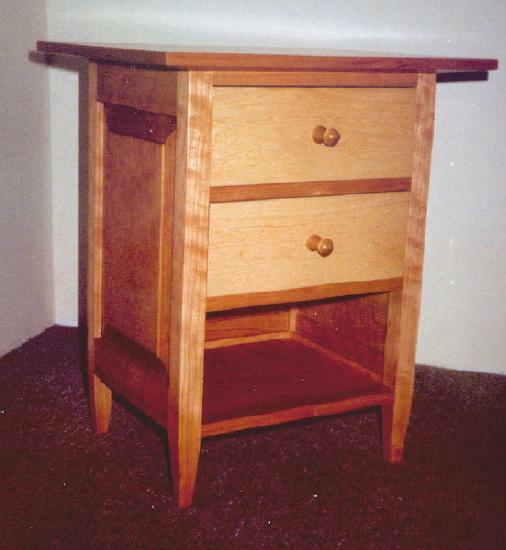 Cherry Two Draw Bedside Table with shelf. Based on the Table above. This beautiful table has solid cherry raised panel sides and back. Natural penetrating oil finish. 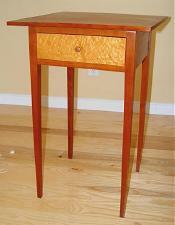 The top measures 17" by 15" and the table is 20 1/2" high. 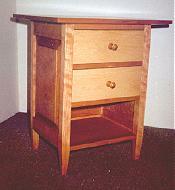 Cherry Bedside Table with single draw and cupboard. This table has raised paneled sides, back and door. Natural penetrating oil finish. Top measures 18" by 18" and the table is 27 1/2" high. 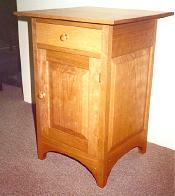 Narrow Side Table with H Stretcher and hand turned leg. 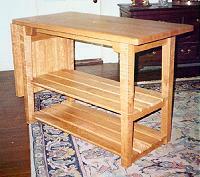 Made from solid elm with a medium brown finish. An excellent table to place in a hallway, behind a couch or where ever space is limited. Table is 60" long by 18" wide by 27" high. Kitchen Work Table with drop leaf extension butcher block top and made from solid cherry wood with penetrating oil finish. 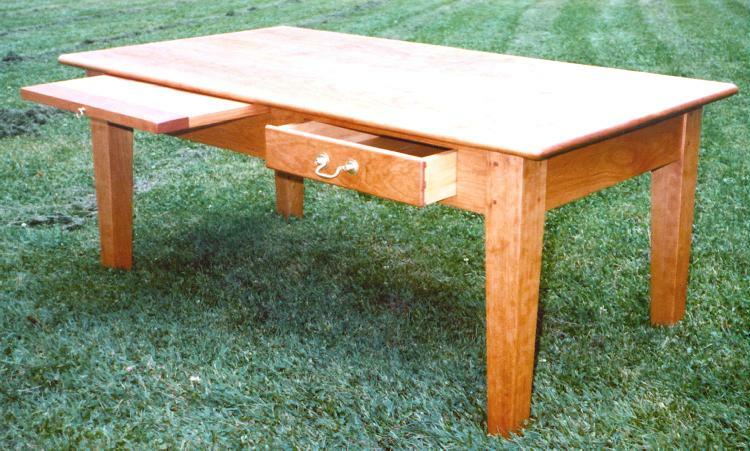 This work table can be fitted with casters making it a useful buffet. 48" long by 24" wide and 39" high. 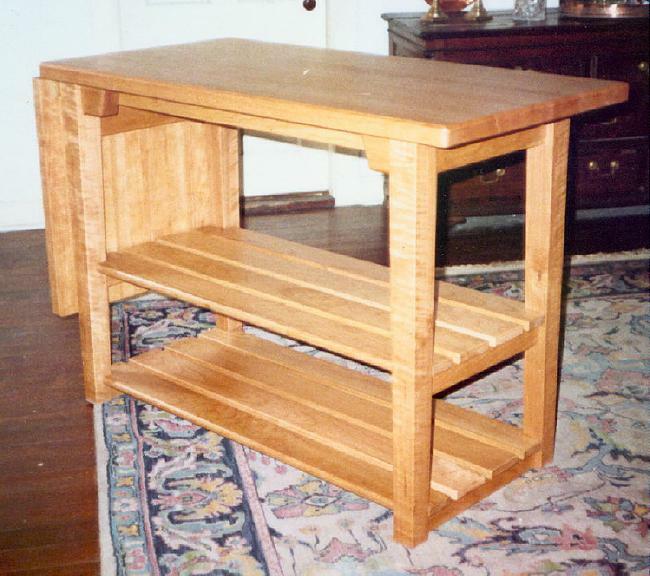 The drop leaf is 24" by 24"
Shaker Style Cherry Wood Coffee Table with draw and a slide. Made from solid cherry with a natural penetrating oil finish. Table is 42" long by 25" wide by 19 1/2" high. Pine and Oak Coffee Table. 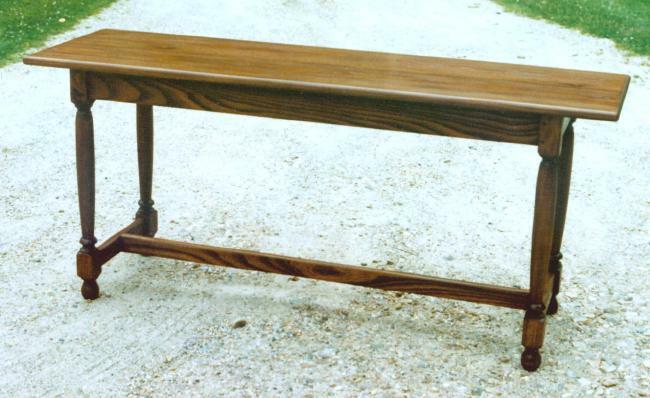 This table is made from a 2" thick pine slab (customer supplied) placed on an oak trestle base. Stained a medium brown. Typical Price: $1500.00 Will depend on price and availability of the slab top.